Connie (Corcoran) Wilson (MS + 30) graduated from the University of Iowa and Western Illinois University, with additional study at Northern Illinois, the University of California at Berkeley and the University of Chicago with degrees in English, Journalism and Education. She taught at six Iowa/Illinois colleges and at the junior high school level in Silvis, Illinois, and has written for five newspapers and eighteen blogs. Her first book (PLS Bookstore, Emerson, NJ) TRAINING THE TEACHER AS A CHAMPION, was published in 1989. 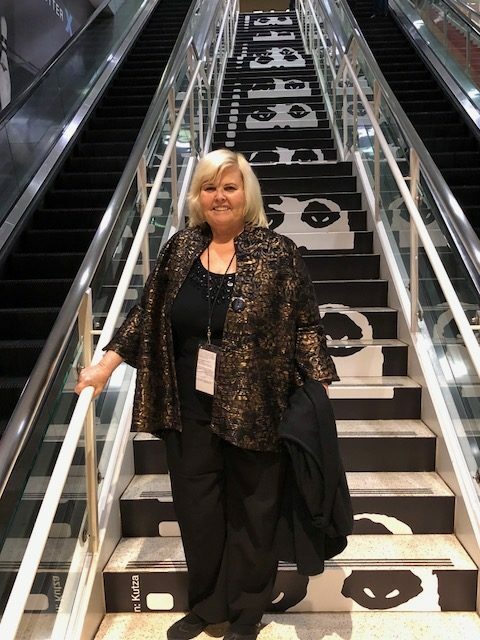 Connie has been an active, voting member of HWA (Horror Writers Association), IWPA (Illinois Women’s Press Association), CWA (Chicago Writers’ Association), MWA (Midwest Writers’ Association), MWC (Midwest Writing Center) and ITWA (International Thriller Writers’ Association). Her stories and interviews have appeared online and in numerous journals and she has over 40 published works.She was named Writer of the Year 2010 by the Midwest Writing Center and won the Silver Feather Award as Writer of the Year from IWPA (Chicago chapter) in 2012 and 2014. 3-books in THE COLOR OF EVIL series were singled out by “Shelf Unbound” magazine in April of 2018 (p. 98, #44) as one of the Top 100 Books of the Year 2018 and her political reporting for Yahoo won her the Content Producer of the Year Award for her coverage of Obama’s run for the presidency. (OBAMA’S ODYSSEY: THE 2008 RACE FOR THE WHITE HOUSE, Vols, I & II). Connie has won Pinnacle awards for her works and her children’s series, THE CHRISTMAS CATS IN SILLY HATS (5 books) was named one of the Best Books published in Chicago by the CWA in 2016. In 2007 “Writer’s Digest” named her one of the winners of its Screenplay competition and her two other series, HELLFIRE & DAMNATION (short stories, 3 volumes) and GHOSTLY TALES OF ROUTE 66 have also won awards. Connie reviewed film and books for the Quad City Times (Davenport, Iowa) from 1970 to 1985 and has been reviewing film continuously in digital format(s) since then, including on her own blog www.WeeklyWilson.com, www.TheMovieBlog.com and www.QuadCities.com. She has covered SXSW and the Chicago International Film Festival for years, the Vancouver International Film Festival, and will cover the San Antonio Film Festival in August. Connie also wrote humor columns (“The Write Stuff”) and conducted celebrity interviews for the (Moline, Illinois) Daily Dispatch and wrote author interviews for International Thriller Writers’ online publication, including interviews with Valerie Plame and Adrian McKinty. Links: http://www.ConnieCWilson.com , http://www.WeeklyWilson.com, www.TheMovieBlog.com, @Connie_C_Wilson on Twitter, Connie Corcoran Wilson on www.Facebook.com, Instagram and Pinterest (www.Pinterest.com), http://www.associatedcontent.com/, http://www.speakaboutit.com/ and http://www.helium.com/. .